Valve has released an update for Counter-Strike Global Offensive on December 6, 2018. The update features an all new battle royale experience, and an update in CS:GO’s pricing. After the recent trend in battle royale style games CS:GO saw it as a perfect opportunity to create a battle royale experience within their game. The CS:GO battle royale is known as Danger Zone. The map in Danger Zone has the old school Counter-Strike feel to it. Not too many flashy graphics or bright colors, but straight edges and multiple lanes. Each game will feature anywhere from 16 to 18 players. If you queue as a solo player you will be put into a lobby with a total of 16 players. If you queue as either a two or three man squad, you will be placed into a game with 18 players. Once the game starts, players will choose their drop in location and repel down from a helicopter to where they would like to begin battle. From their they will begin looting weapons, health, cash and more to use throughout the match. Each match lasts around 10 minutes, and is very quick paced. Once you engage an enemy you will notice the battle royale weapons behave the same as matchmaking weapons. However, because players can have up to 120 health (20 more than matchmaking) some shots may not be as lethal as they would be in multiplayer. By playing the game you will earn XP. To earn XP players will need to either looting the environment, killing enemies or surviving. Once you have earned 250 XP you will unlock the Souvenir MP5-SD. The Souvenir MP5-SD is only available to players until January 9th, 2019. After 19 years of being a paid to play game, Counter-Strike has officially become free to play. If you have previously purchased CS:GO prior to the free to play release your account will converted into a “Prime Account”. Along with the prime account status players who played prior to the Danger Zone update will receive a loyalty badge they can display on their profile. To go along with the Danger Zone update a new case has been added. 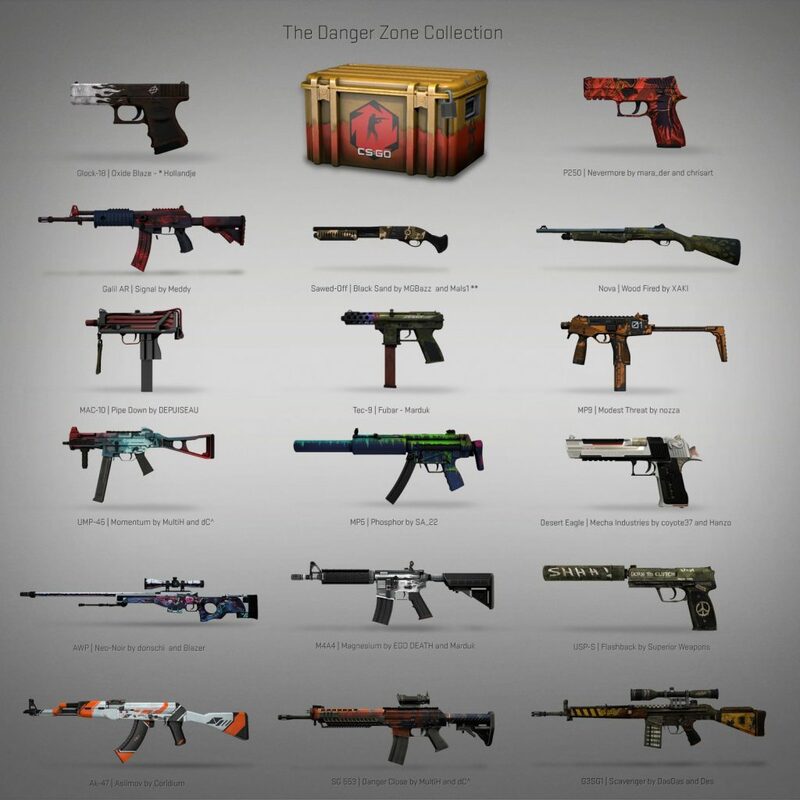 Within the case is multiple different skins that players can use in the Danger Zone battle royale or matchmaking.